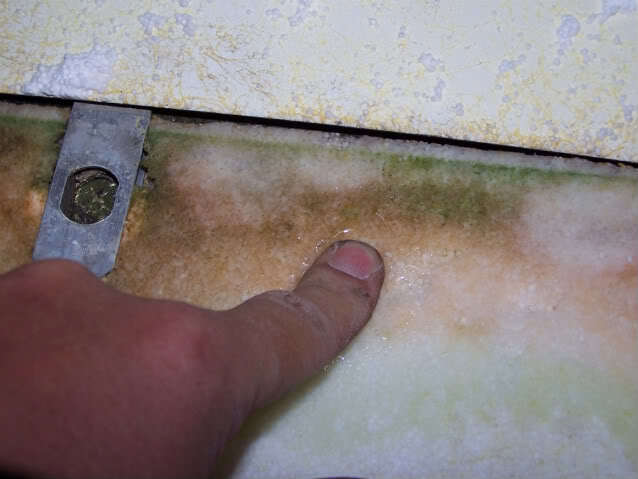 I have a 2005 T-2363 and when uncovering from winter storage I noticed a crack in the caulking in the front right corner of my roof. Thanks to members of this forum I was directed to buy some Dicor lap sealent to patch things up. I do not have any visible water damage on my ceiling or at the top of my walls. When I went to my dealer to buy the lap sealant he told me that chances were slim that this crack in the caulk would result in a leak. The caulk around the front window looks good and my water system is intact. Could I have a leak at the roof that ran down inside the wall so all my damage shows at the floor level and not at the ceiling level? I have sealed up the crack on the roof but now wonder if I should re-seal around my front windo and front compartment doors. And if I re-seal them, can use the lap sealant? I'd appreciate any comments anyone has on where my leak might be and what I could do to patch it up. 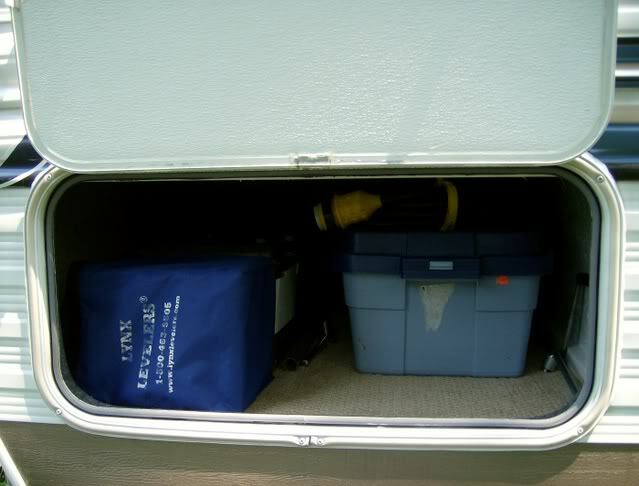 The small front cargo doors on the 2363 are prone to leakage if anything heavy is pushed into the storage space. The metal stop rim around the hole also serves as the lock bar for the door and will bend allowing the door to have some play. Check the door at night with a flashlight inside to see if the doors are the problem. Could I have a leak at the roof that ran down inside the wall so all my damage shows at the floor level and not at the ceiling level? It's possible, but I think the setback of the roof combined with the angles in the front wall would make it rather unlikely. Certainly check what Maker's Mark pointed out as that seems a likely suspect. 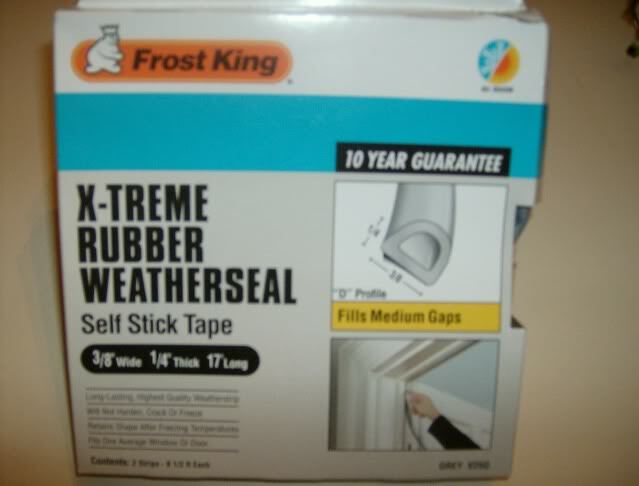 Honestly, if they're really leaking, the best way to re-seal windows or compartment doors is to remove them, clean the mating surfaces, replace the sealing tape and reinstall. Caulking around those items would then be more of a belt and suspenders approach. If you do wish to caulk around them, just don't use the Self Leveling lap sealant. It's designed to run out and flatten out, so if you run a vertical bead of the stuff, you will find it in a puddle on the ground in fairly short order (or worse, all over the side of the coach!). On our '05 2380, the rain gutter (which has no spouts yet- coming soon, VERY soon) ends directly over the small cargo door- I plan on putting the gutter ends on soon because I noticed the watermarks going down directly to the center of the top of the door frame. Thanks for the helpful suggestions. I appreciate everyone's help. We camped this weekend and we got a lot of rain. I spent a good deal of time with my head under the couch with a flashlight and see that the small compartment door is leaking some around the gasket and around the frame itself. It's not leaking a great deal but it is leaking so I'm going to focus my efforts there. 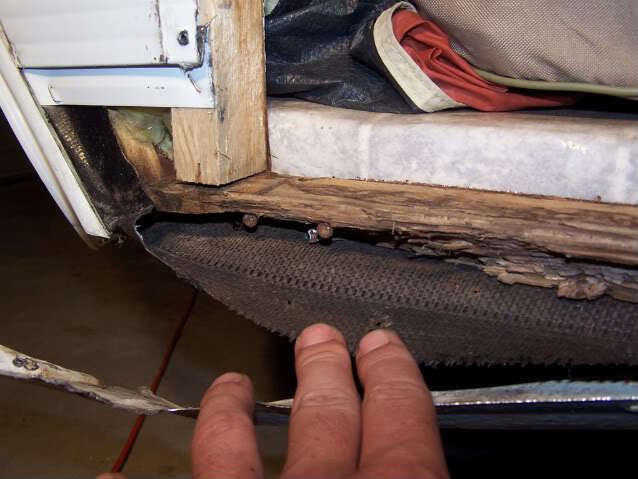 I'm beginning to think that maybe my problems came from a combination of the crack in the roof caulking and the compartment door. Hey, thanks Rich! I was eyeballing that exact stuff myself for when I do mine (and when I get around to the plexi storm door conversion...seal it up real nice-like!). Looks good. I'm in need of some seal replacing as well. Have no leaks yet and like to keep it that way. Well... Rich got me poking around in my storage compartment. I'd seen a water stain on the frame right inside the door. Last night after seeing his pic I decided to poke around a little and pull the door. 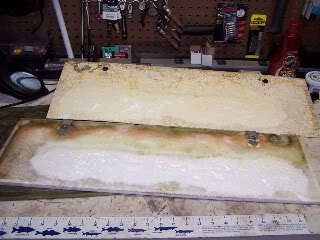 When I took apart the door I found this... saturated styro.... the camper has been in the garage for about a month now. You can see the water. I don't suspect anymore wood damage, what's left is decent and solid. It also doesn't appear to be much involved in weight bearing. My solution is going to be to get a wood chisel and make a mating surface to the existing piece bottom and cut a small block to fit and glue and screw into the cut out. I'll treat everything with an expoxy sealer and reseal the door after I reconstruct it and the frame... properly. It was evident someone had messed with it at some point. I'm pretty confident the source of the ingress was the door seal... should I look somewhere else specifically that might be a culprit to the water getting in? Any suggestions or other remedies would be appreciated... thanks! Thanks Rich... I think you saved me a hassle if I wouldn't have seen your sealing job and been inclined to start my next project.